Two days ago, the ISM crew in Nablus visited the Theatre in Jenin, which opened in 2006 to bring performance, creativity, and self-expression to the refugee camp that, just four years earlier, had suffered one of the most horrible massacres related to the Israel-Palestine conflict in recent memory. There is theater which pleases the nobles, theater which entertains the bourgeoisie as it wines and dines; and there is theater which enlivens the masses, theater which speaks to the oppressed, theater which embodies a people’s sorrow and moves it to action. The Freedom Theatre pitches its tent with the latter camp. By opening the minds of Jenin youth to the joys of theatre, it embodies and actualizes the vital potential of art as collective therapy, performance as communal catharsis, and dramatic theatre as a vehicle for the self-expression, self-determination and strengthening of a battered community. The citizens of Jenin, male and female, young and old, are given the space to act out the trauma inflicted on them by the occupation; they are given a space to assert themselves as independent, creative humans, to act out their imaginative potential; they are given a space to realize their community as one capable, in the midst of poverty, of producing theater that enlivens the imagination and emboldens the sensibilities. This heals the individual and binds the social body together, in one empowering stroke. This is the transformative, illuminative power of art in every human community, and it is especially necessary for an oppressed populace, who are told by the oppressor to keep their heads and hearts low, and their mouths and minds shut. By creating culture, the populace realizes it has the power to create culture, that it has the culture, that it is culture- and this itself is a supreme act of resistance, for aside from demolishing homes and crippling economies, Israel seeks above all to cripple the soul of the Palestinian community, to occupy the mind and spirit of the people, to breed an oppressed populace that does not believe in itself, or that believes itself to be sub-human, subservient scum. Beneath the surface picture of the occupation, where Israel appears as the power that simply wants the land for itself, the power whose brutal oppression of Palestinians has as its final goal and driving purpose to create the conditions that will compel them to leave Judea and Samaria- there is a deeper, more sinister reality, whereby Israel actually needs the Palestinians around as a second-class proletarian workforce, as an ostracized Other apart from which the Israelis can concretize and affirm their group identity as a superior people, and towards which the Knesset can constantly wield its sword, so as to distract the Israeli people away from concrete social problems. In all modern instances of structural oppression, capitalism craves a culturally subservient proletariat that works hard and is paid little, that pays taxes and does not expect social services in return, that cleans the toilets of the bourgeoisie and stays silent, that accepts second-class citizenship, or no citizenship at all, without a struggle, that lives in the constant fear of unemployment or persecution, and so cleaves for protection to the very social system that dangles it over the abyss. To awaken this proletariat to the impossibility of its existence, and to the possibility of its liberation, is the task of revolutionary politics, whose audience is history and whose stage is the present. At two thirty in the morning, I was the only one awake in the Nablus flat; everyone else, drained from the frenzy of last night’s 4 A.M. IDF invasion of Hebron, had passed out early. I, however, had sublimated my lack of sleep, through the aid of coffee and tea, into an even greater manic addiction to keeping watch on the Twitter feeds. For at midnight, the IDF had raided Hebron again, this time to surround a house, blow it up, and arrest a man inside for ties to Hamas. Local shebab rioted in reaction to this, and 30 were injured with rubber-coated steel bullets and high velocity tear gas canisters which, contrary to safety regulations, were fired not in the air but directly at the Palestinians. Like last night, I was assigned the task of watching Twitter feed after Twitter feed- ‘IDF invades Hebron, 30 injured’; ‘Zionist forces are in Hebron again! Anyone know what is happening?’; ‘while the world watches Tripoli, Israel bombs Gaza and invades Hebron’- and relaying any new info to the ISMers who were on the ground in Hebron, sneaking past the closed checkpoints, videotaping the soldiers. As this was unfolding, I had another Twitter page updating me on ‘al Aqsa’- a rally for Gaza which started around Damascus Gate had been suppressed by the IDF (after reports of a Palestinian stabbing a soldier), who were attacking Palestinian ambulances and medics and beating protesters; the situation climaxed when protesters made their way to Al Aqsa Mosque, and then were sealed inside by the IDF, who simultaneously closed several entrances to the Old city and flew Apache helicopters over the mosque. ISMers in Sheikh Jarrah went to the scene just as it was clearing up. Several Palestinians were detained and interrogated at a detention center west of Jerusalem. At about 2:30 I got a call that the Freedom Theatre had been attacked. I woke up the rest of ISM at the flat, who rose like pissed off lions, stomped around on the telephone, smoked cigarettes, cursed the occupation and determined if we should take the hour-long taxi ride to Jenin. Then we got a Facebook message from a friend in Nablus, who (along with her family) had just heard gunfire and seen IDF jeeps in the city. Suddenly the air grew very tense. We walked out on the roof to listen very closely for sounds of the IDF in the city. We were all very sleep deprived, jumpy and paranoid. This was the second night in a row that the IDF had swept through the West Bank in the early hours of the morning, and we had been nervously expecting that they would come to Nablus. Eventually we determined that nothing was happening in Nablus, and we got a call that the IDF had driven away from Jenin with two detainees. I fell asleep as the sun was rising, with coffee in my veins. As I said, this is the third arrest to strike the Jenin Freedom Theatre this month. A few members of the Theatre, due to be released later this week, have been held all month by the IDF on the absurd pretense that they are needed for questioning regarding the murder of Juliano Mer Khamis. Juliano Mer Khamis, born of an Israeli-Arab intellectual father and a Jewish Communist mother, spent his life championing Palestinian rights, in the belief that, as he said in 2009, “I am 100% Palestinian and 100% Jewish”. 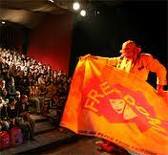 In the 1980s, his mother established a children’s camp in Jenin, and in 2006, he established the Freedom Theatre. 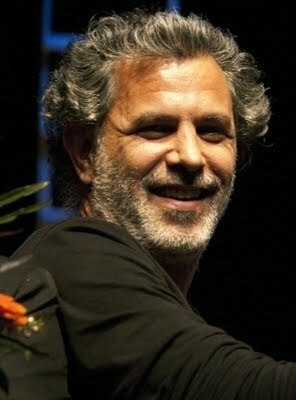 On April 4, 2011, he was driving in his car outside the Theatre when he was shot and killed by masked gunmen. As of yet, nobody knows who killed him, but his memory will live on forever as an example of an Israeli who saw through Israeli aggression, and went into the heart of Jenin to inspire the populace, to actively make a better world. Shortly after his death, the Freedom Theatre nearly collapsed due to the loss of its founder and chief organizer, but through a renewed will and determination it lives on. I have a feeling that something will happen tonight, somewhere in the West Bank. Nablus is a perfect target, and I hope that the city, and the rest of the West Bank, remains safe tonight.